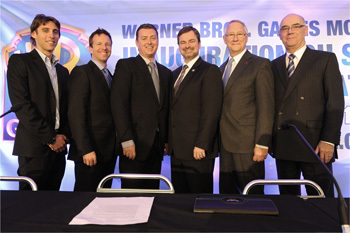 Warner Bros has released this photo in celebration of the official inauguration of its brand new WB Games Montreal Studio. In the photo are: Reid Schneider, Vice President and Executive Producer; Martin Carrier, Vice President and Studio Head; Martin Tremblay, President of Warner Bros. Interactive Entertainment; Alain Paquet, Minister for Finance; Gérald Tremblay, Mayor of Montreal; and Jacques Daoust, President and CEO, Investissement Quebec. This entry was posted on Tuesday, November 1st, 2011 at 4:45 am and is filed under Business News, Events, National News, Studios. You can follow any responses to this entry through the RSS 2.0 feed. You can leave a response, or trackback from your own site.